Phentaslim is a diet pill that caught our attention with very bold self-proclamations of being "simply one of the easiest ways to lose weight for good". However, anytime a product refers to itself as the best product on the market, our team cannot wait to dig into the research and uncover the truth. Ninety-nine percent of the time these positive reviews come from the product's website itself and we were not surprised to see Phentaslim is no exception. But despite Phentaslim's sensational advertising, what really matters is: does the pill work? So let's take a closer look. Phentaslim is manufactured by Optimum Nutra Inc, a company based out of Panama. This company produces products not only available in the US but internationally as well. Along with Phentaslim, Optimum Nutra Inc makes one other diet pill supplement, Superfruit Slim. However, the company website looks less like a website and more like a blog. But interestingly enough the Phentaslim website looks fantastic. Although this could mean many things, one thing it does NOT mean is consistency among the brand. Anytime a product's website is more appealing than the company behind it, there is a strong chance that advertising plays a larger role than the actual merit of the product itself. 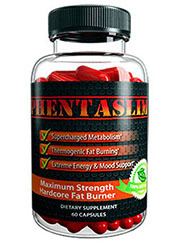 Like many other diet pills claiming amazing results, Phentaslim contains a heavy dosage of caffeine per serving. This typically serves as the product's "hunger control" ingredient but in all actuality the customer would see the same results if they just drank an extra couple cups of coffee a day. Moreover, for customers who are sensitive to caffeine they will probably feel all of the usual side effects associated with too much caffeine such as headaches, dizziness, anxiety, and trouble getting to sleep. Possible side effects from caffeine such as headaches, dizziness, anxiety, and trouble getting to sleep. Although the product also contains green tea extract and capsicum, among others, the green tea extract is so miniscule in Phentaslim it would appear the company is more interested in putting the label on their bottle rather than a hearty amount of it in their product. Insofar as the capsicum extract in concerned, this ingredient is largely unproven seeing as most research has been done on capsicum extract in conjunction with other ingredients, meaning the sole effects of capsicum itself are still mainly unproven and should not be taken as fact. However, on the bright side the product is fairly cheap. (A month's supply of Phentaslim can be purchased for about 60 dollars.) Moreover, the product offers a full 30 day money back guarantee, as well as discreet shipping and packaging. Although Phentaslim may entice customers with a decent price and rave customer reviews, it is important to keep in mind that most of the reviews are on the product's own website (so more than likely written by someone who works for the company). Furthermore, the ingredients are hardly impressive and are not vegetarian friendly. On the whole, the supplement contains only six vitamins and minerals, a hearty dose of caffeine, and a few buzzword supplements at ineffective doses. The company even acknowledges its product's high dose of caffeine and advises consumers to not take the pill after 3pm unless they want to be up all night. Perhaps this is how some people want to lose weight, but others might as well stick to coffee and exercise! Bottom line: Don't be fooled, Phentaslim is just another caffeine pill with a good label and some vitamins thrown into the mix.